Chinatown is set against the backdrop of Singapore's modern infrastructure and the prosperous financial district. It is a crowded and colourful network of streets and alleyways contained by Upper Pickering Street, Cantonment Road, New Bridge and South Bridge Road. The area is a receptacle of traditional Chinese customs that were carried to Singapore by immigrants in Chinese Junks from the provinces of Guangdong and Fujian in the early 19th century. Temples, terraces, markets and shops still provide a glimpse of the old ways but much of its original character has been lost in the redevelopment of the past 30 years. Yixing Xuan's Teahouse provides a fascinating insight into the ancient, ritualistic art of tea-making, while a visit to the Thian Hock Keng Temple leaves one in awe of Chinese traditions of worship and symbolism. Many medicinal shops in the district sell traditional healing paraphernalia. Here snake skins are blended with herbs and spices to produce powerful potions for various ailments. The streets are a delight for bargain hunters looking to buy kimonos, jewellery, t-shirts, pottery and traditional crafts. 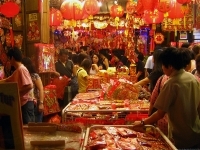 Tanjong Pagar is the area best known for its traditional crafts such as painted masks, paper umbrellas, clogs and kites. Electronic goods, luggage, textiles and other more conventional products can be found in Chinatown's modern section located at the intersection of Cross, New Bridge Road and Eu Tong Street.